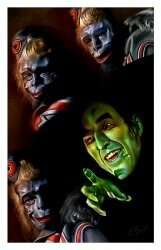 Up and coming horror artist Rob Birchfield's Wizard of Oz "Monkey Business" art print. Open edition. Hand signed by the artist.